Dedicated Lane for Distracted Walkers: No Joke! 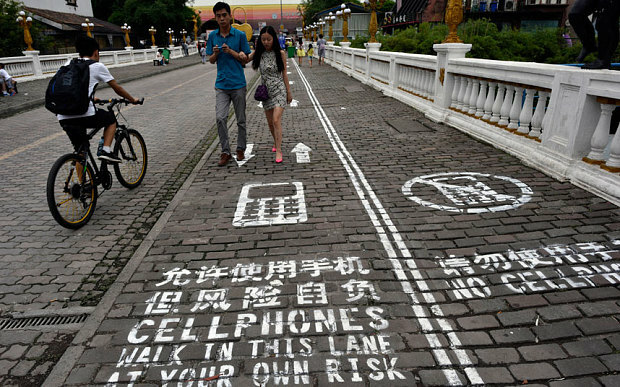 A 100 foot-stretch of sidewalk in the city of Chongqing claims to be the first street for mobile phone addicts in China. People with eyes fixed on their screens have their own specially painted lane. Mobile phone users follow white arrows painted on one side of the sidewalk. No need to lift heads from the glued gaze at devices; the arrows direct underfoot. Could the idea (and the very spray-painted stencils) have been copied almost exactly from a program on the National Geographic channel earlier this year? Mobile phone addiction is rampant in China, as it is worldwide. One recent survey by zhaopin.com, a recruitment site, suggested that 80 per cent of the 10,000 white collar workers it polled admitted “severe addiction” to their phones. This entry was posted in Uncategorized and tagged cell phone use while walking, China, Chinese mobile phone use, Chongqing, dedicated lane for texters, falling, feet, mobile phone use while walking, mobile phones, National Geographic TV channel, pedestrian safety, pedestrians, prevention of accidents while walking, sidewalk etiquette, texters in China with dedicated lane, texting and walking, tripping, walking, walking and texting. Bookmark the permalink. ← Dedicated Lane for Distracted Walkers: Joke!